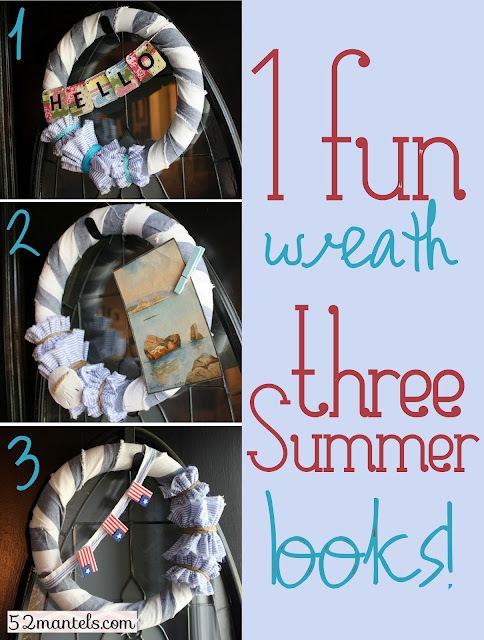 52 Mantels: One Summer Wreath, 3 Different Looks! One Summer Wreath, 3 Different Looks! A fresh, new Summer wreath has been on my to-do list for the last several weeks. But, let's face it, with a long (and ever growing!) to-do list, a new wreath is hardly a priority. But, last night, in a burst of inspiration (and perhaps procrastination of other tasks), I finally made that basic, Summer wreath. And, then I came up with three looks to take my wreath all the way from Memorial Day to the first hints of Fall. Whew. Glad one thing's checked off my list. I have been LOVING all the nautical nods I'm seeing in stores and magazines lately! Blue and white stripes, casual linens, touches of rope and jute. So fresh and so...well...Summery! I started this project with a deeply discounted blue and white striped, linen curtain panel. At under $7 for 84 inches of fabric, it was a steal! I decided to bite the bullet and buy a new styrofoam wreath form from Hobby Lobby. Turns out it was around $3 with my (ever present!) 40% off coupon. Why did I think they were more expensive than that? To make the basic wreath: 1) gather your supplies- a yard or so of fabric, a styrofoam wreath form, push pins, a 1/2 a yard (or so) of contrasting fabric (in this case, blue/white ticking) and rope, jute or twine. 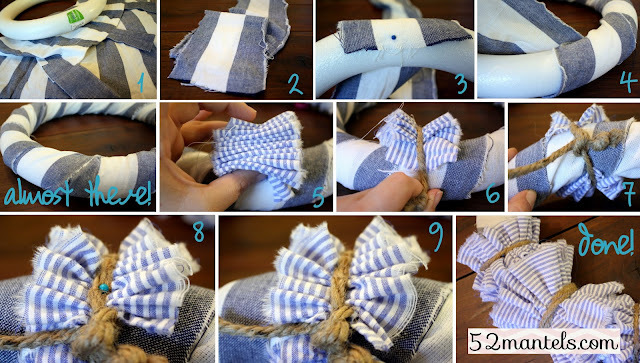 2) tear fabric into 3-4 inch wide strips 3) start by attaching one end of your fabric to the back of your wreath form using a straight pin 4) wrap it around the wreath, careful to maintain the stripe, if applicable. Attach the end with another pin. Use as many strips of fabric as needed to cover your wreath. I used 2-70x3 inch strips. When finished, you should have a completely covered wreath form! To make the ruffled details: 5) take a 3x15 (ish) inch strip of contrasting fabric and accordion it up and position it on top of your wreath 6) take a length of rope and wrap it around the accordioned fabric 7) knot the rope at the back of the wreath 8) take the fabric and pull it around the wreath, spacing the gathers evenly. 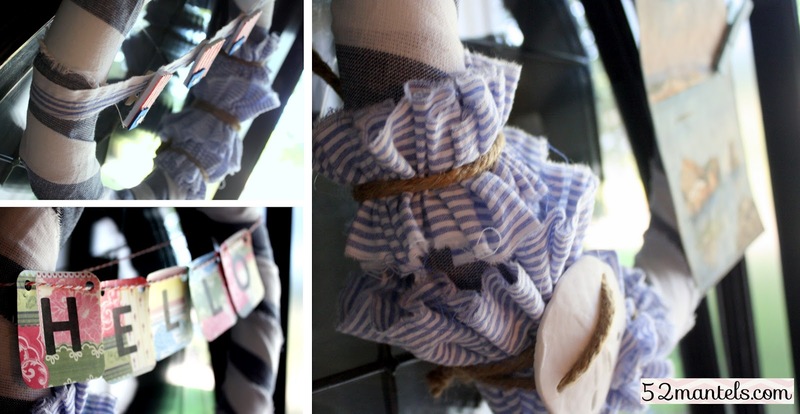 Pin your ruffles in place with one or two straight pins 9) pull the rope fibers over the head of the pins to disguise. Repeat steps 5-9 twice more, creating 3 ruffles. FYI-my middle ruffle was twice the width of the two outer ruffles. To make the Patriotic Wreath, I simply took a scrap of fabric and pinned it to the back of the wreath and then hung flag clothespins from it, creating a flag bunting. For the Hello Wreath, I printed HELLO on cardstock (using black ink in my home printer), cut the cardstock into squares and used my corner rounder to make the rounded edges. Then I strung my letters up with baker's twine. I then took lengths of aqua ribbon and covered the rope detail, securing it to the back with straight pins. For the Beachy Wreath, I tied a sand-dollar to the middle ruffle, using a length of my rope. I then added a beach watercolor to the wreath with a blue clothespin. 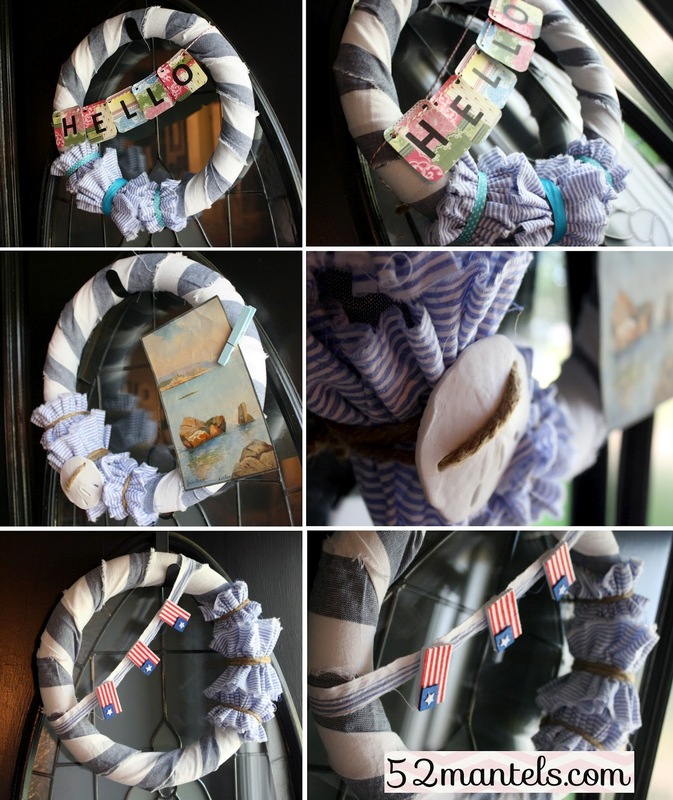 Other options for the beachy wreath would be; photographs from past beach vacations, postcards to beach destinations, vintage beach paintings, etc. So many ways to go with this wreath! I hope you have a great weekend and get to spend some time in the sun! Ahhh, I love the weeks leading up to Summer, don't you?? Hi, Just discovered your blog! Super cute, I might get lost for hours! :) I linked up a bunch of my recent projects, I'd love for you to check out my blog sometime too! But I love your idea of making one wreath extend for more than a single season! Nice job Emily! I love all of them, but I think I like the patriotic one best! I'm always a sucker for red, white and blue! Thanks for showing us this versatile project! I'm not sure which one I like the best. Great price on that curtain panel! Did you use it all up or is there another project coming out of it?? I'm making these for gifts!! I kinda sorta did the same thing but not in advance. I made it easily changeable but not with the next "plan" in mind (which is why it is still the same since early spring)...I will CERTAINLY do it your way next time! Such a clever idea to switch it out through out summer. The beachy look is my favorite! Emily, I LOVE how versatile this project is! You can keep your look fresh and new with just a few changes...awesome! any other state or if you are moving to or from Australia, be sure to obtain the services of a decent overseas moving company.